Effect Pigments guarantee brilliant performances in various industries, mainly in the plastic processing, printing industry and the color and coating industry. They open up an infinite array of colors and effects that create unlimited design possibilities. The oldest evidences that we have found about the use of Effect Pigments are the cave paintings of the ice age people. Today, a lot variety of effect pigments have come into existence in every aspects of our lives. By using the effect pigments, one can get access many unique effects. These effects include the visual world effect with a decorative look, flickering lights and amazing effects. These pigments bring a new feeling and give new effect to the colors with sparkle and tremulousness. All the conventional organic or inorganic color pigments come in this category. These pigments absorb a particular wavelength of the incoming light. These pigments don't produce any lustre, because of their irregular shapes. Metallic Pigments comprise of very small platelets of aluminum, copper, zinc. The formation and differentiation of opaque pigments are possible due to these metallic pigments on the basis of the surface lustre. Pearl Lustre Pigments are suitable to be used in almost all of the printing inks. They are semi-transparent. These pigments are based on guanin or bismuth oxychloride, mica minerals. In these pigments, the light reflects in between the different layers of the pigments. This phenomena makes these pigments very lustre. To call up the quality, luxury and durability in various applications. The addition of special effect pigments into plastics allows formulators. To bestow an emotional aspect upon the products. To strengthen the concept of product differentiation and branding of different product categories. To provide a gorgeous and attractive appearance in the materials. To bring sophistication and depth in the packaging process. The special effect pigments may bring a metallic look into plastic materials. These are lamellar flakes. The very thin platelets of special effect pigments can be readily obtained due to their shapes. 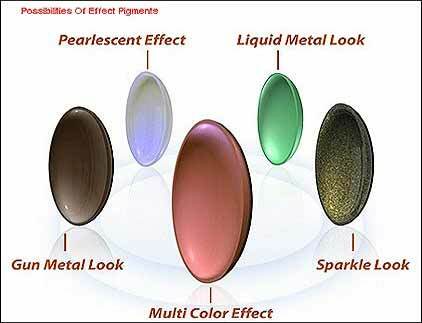 On the basic of transparent and opaque effects of the effective pigments, they can be classified into two more groups. The platelets of Transparent Pigments can partly transmit light and for this phenomena these pigments can produce a special kind of shimmery lustre. The refractive index of these platelets is low. The figure describes the light mechanism of Transparent Pigments. Transparent Effect Pigments have affinity with almost all thermoplastics. The platelets of the opaque pigments don't transmit light. These platelets only reflect the the light and during reflection they also absorb light partially.